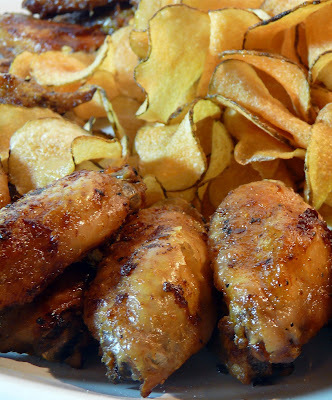 Wings and homemade potato chips. Very simple. Rubbed with a mixture of fresh garlic, butter,salt, pepper and lots of hot cayenne pepper. Roasted in a 450 oven turning once. At the last minute I decided I wanted a sauce/dip but not a BBQ sauce so I mixed up a little chili garlic sauce with more garlic, fresh grated ginger and rice wine vinegar for an Asian style dip. It worked. it all looks and sounds great! sigh...your husband is a lucky man! And I bet he knows it too!